Jupp Heynckes named Bayern Munich's youngest starting XI in 47 years for the Bundesliga champions' clash with Eintracht Frankfurt at Allianz Arena. 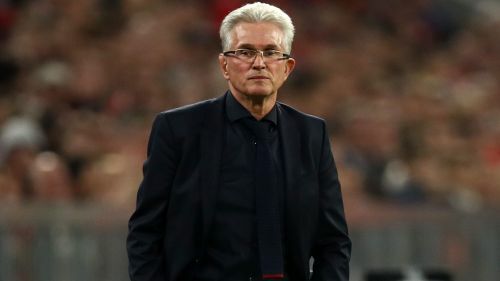 Facing the task of overturning a 2-1 deficit to Real Madrid in the second leg of Tuesday's Champions League semi-final, Heynckes rested a glut of Bayern's stars for Saturday's encounter against Frankurt, coached by Niko Kovac, who will take charge of the Bavarian giants at the end of the campaign. Bayern made eight changes in total, with only Mats Hummels, Sven Ulreich and Joshua Kimmich retaining their places. Three debutants - Niklas Dorsch, Meritan Shabani and 17-year-old Franck Evina came into Bayern's line-up - while defender Lars Lukas Mai, who signed his first professional deal on Friday, started just his second Bundesliga game. Thomas Muller, James Rodriguez and Robert Lewandowski were among the key players on Bayern's bench.